I downloaded the following dataset from DUO (Dienst uitvoering onderwijs): [Aantal wo ingeschrevenen (binnen domein ho)]. This dataset has a cc0 declaration, which means it is in the public domain and we can do anything we want with this file. More information about the file can be found in the Toelichting.pdf. Download the .sav file to start. Do remember where you put the file, you will need it later. Or let R download the file, even better for reasons of reproducability. Consider starting a new project for this example. Fire up your trusty rstudio. and fill in the names, or type `install.packages(“haven”, “dplyr”). Follow the description below or look at the complete script at:github.com/RMHogervorst/cleancodeexamples. The script and this page are more or less the same (spelling might be better here ;p ). # UPDATE 2017-08-23 THIS IS A NEW SPSS FILE FROM 2016 DATA. So we activated the necessary packages, saved a link to the datafile, told the read_sav() command where to find the file, and finally assigned the output of the command to a name wo2015. The following commands are very often the first things you will use when you get your hands on a new dataset. names(wo2015) # what are the columnsnames? # there is also a tail() function you could try. 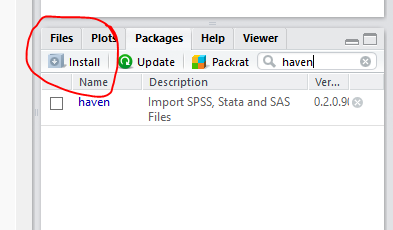 The Rstudio interface already gives you all sorts of information. Just click on all the things in the environment window. the structure command str() displays in your console, and is identical to what Rstudio tells you if you click the blue button in front of the data.frame. The table command is very useful, but when there are many values, you can get a cleaner look by View(table()). The sapply() command is one you might use a lot in the future, but know now that it repeats a function over the columns of your data.frame and gives you a simple result back. Most of the columns are of class character, some are numeric, and two are of the class “labelled”. When we used the command View(table(wo2015$SOORT.INSTELLING)) there were actually three commands in sequence. When looking at the endresult from the last command, you can see the frequencies of the types of SOORT INSTELLING (type of university). As you know SPSS cannot work with factor (nominal) values. You have to tell SPSS that the variable is a nominal variable and you have to create numbered values, with a label assigned to the values (3 = male, 4 = female). When you import a .sav file into R that information can get lost. But on the other hand you might want to use the numbered information. As an compromise the haven package imports the numbers and the labels. So can we find the labels? class(wo2015$OPLEIDINGSVORM) # no, that just tells us that it's labelled. You can see the labels and numbers. 1 = deeltijd (part time education), 2 = duaal (), 3 is voltijd (full time) The attributes command works on everything try: attributes(wo2015[1,2]). So we can display the labels with number. but we would rather use that information in R. R has no problem with nominal variables. And furthermore you won’t make mistakes about which form of eduction your talking about. Data manipulation was sometimes hard with r. However the dplyr package changed everything. There are 7 ‘verbs’ that do all the work. Filter filters rows, select selects columns, distinct is a variant of unique and mutate creates new variables. These verbs are tools, the plyrs of a dataframe. Very generic tools that help you select and filter your data. All the verbs have the same arguments: first argument = dataframe, the next arguments are for the function. But don’t believe me on my word, let’s get to work. Select is used to select variables (columns) in your data frame. We have selected 4 variables. as you can see in the output. It also says: Source: local data frame [2,417 x 4] meaning 2417 cases and 4 variables. Filter selects cases (rows of the dataframe). But not always: filter(select(wo2015, OPLEIDINGSVORM2,j2012.MAN, j2013.MAN ), PROVINCIE == "Limburg") will not work (try it). Why not? The different functions accept data.frames as input and give a data.frame as output. The data.frame from the select action does not contain the column PROVINCIE. Therefore the filter function can’t select on that variable. arrange(wo2015, GEMEENTENUMMER) # data frame [2,417 x 24] all cases, all variables. MUTATE(dataframe, name_of new variable = action). Mutate creates new variables from other variables. Let’s find the difference between 2015 and 2014 in males. Scroll to the end of the viewer or use test$from14to15M. An other way would be to select the variables first. But these nested commands become complicated very fast. You lose the overview of your actions. But since 2014 we can use a new way to type commands in R.
With the pipe operator (%>%) you can chain the commands together. The functions work the same but it is much easier to read. # much easier to read! The pipe operator puts the data.frame from the left side as first argument in the right side. # take the dataframe, THEN mutate                       THEN select these variables. Take the data.frame, THEN mutate THEN select these variables. The commands follow in the way that you use them instead of nested in each other. Use summarize to apply functions over groups of cases. For instance the mean of an entire column. # there is no mean value. # That was an OR operator, there is also an AND. The summarize command can make multiple columns (remember that every output is also a dataframe). Finally a filter action with numbers. Just to show you that that works as well. We start with all the cases, THEN only take the cases (rows) where variable j2011.VROUW has less or equal to 10, THEN take only the propedeuse cases THEN filter the cases with more then 10 cases and THEN group the cases by provincie, and THEN count the number of cases per province. filter(OPLEIDINGSFASE.ACTUEEL == "propedeuse bachelor") %>% # multipe filters? no problem. filter(j2015.VROUW > 10)  %>% # more then 10 in 2015. In every province, how many programs had less then 10 women in 2011 and more then 10 in 2015? In this lesson you have learned to open .sav files with haven, how to change labelled values from the Haven package, and worked with most of the dplyr commands. dplyr is also called the grammar of data manipulation. In the next lesson we will take on the grammar of graphics with ggplot2, see you then.